Steve Connolly knew there were worse things than being a middle reliever, according to The Los Angeles Times. He could be out of baseball. "Nobody wants to be groomed as a middle reliever," Connolly told The Times in June 1989. "But I don't want to go around moping. You make the most of what you get. As long as I get some innings I'll be happy." 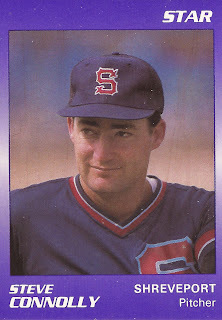 Connolly began his career as a starter in rookie ball in 1987. By 1989, he'd made AA Shreveport and largely turned reliever. But relieving wasn't Connolly's path to the majors. He played just four seasons as a pro. He never made it higher than AA. Connolly started in baseball in 1987, signed by the Giants as an undrafted free agent out of UC Santa Barbara. Connolly played his first season at rookie Pocatello. He got into 13 starts, going 3-7, with a 4.25 ERA. That July, Connolly had a hand in history, just not the kind he and his teammates wanted to be a part of. Connolly gave up runs in both the Salt Lake Trappers' 27th and 28th-straight wins, setting the professional record. He picked up the loss in their 28th win. Connolly moved to single-A Clinton for 1988 and served in relief. He got into 41 games, starting one. He also posted a 1.38 ERA and made the Midwest League All-Star game. He also saved 10 games. At AA Shreveport in 1989, Connolly got into 38 games, starting nine. He picked up eight wins to three losses, with a 3.01 ERA. He then got into 50 relief outings at Shreveport, with a 3.19 ERA, marking the end of his career.